An Immaculately Presented Property in a Quiet Location with a Tree-lined Outlook. 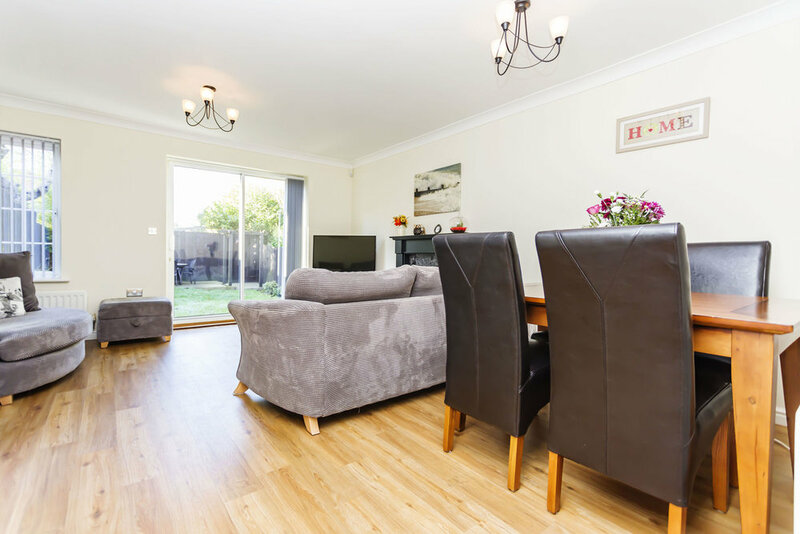 This IMMACULATELY PRESENTED property is set back within this modern development with a BEAUTIFUL TREE LINED OUTLOOK and delivering a very quiet and secluded feel. Offering an ideal opportunity to move straight in and add your personal touch this generously proportioned property offers kitchen/ breakfast room, large lounge/diner, 3 bedrooms with ensuite to Master and a private rear garden. Alder Heights is a modern development conveniently located with in walking distance of the local shops and bus routes on Ashley Rd along with Branksome train station close by. By also having easy access to Bournemouth with its great links to motorways and train services to London Waterloo as well as its own airport & the town of Poole is also only a short drive away with Ferry sailings to Cherbourg. The property is one of a small collection of houses at the rear of the development accessed via a few steps. It has great curb appeal with a large area laid to lawn and a number of scattered trees that give the property a real secluded feel as well as looking attractive when in bloom. The wooded area provides a fantastic approach to this modern semi-detached property. The property resides at the far end and is presented in immaculate condition throughout, as you enter through the front entrance into the hallway the interior is fresh and modern with solid wood flooring throughout the ground floor. To your right is the kitchen/breakfast room, a good size with plenty of work top space to prepare the family meals. The worktop extends around the kitchen creating a handy breakfast bar to enjoy the morning coffee. 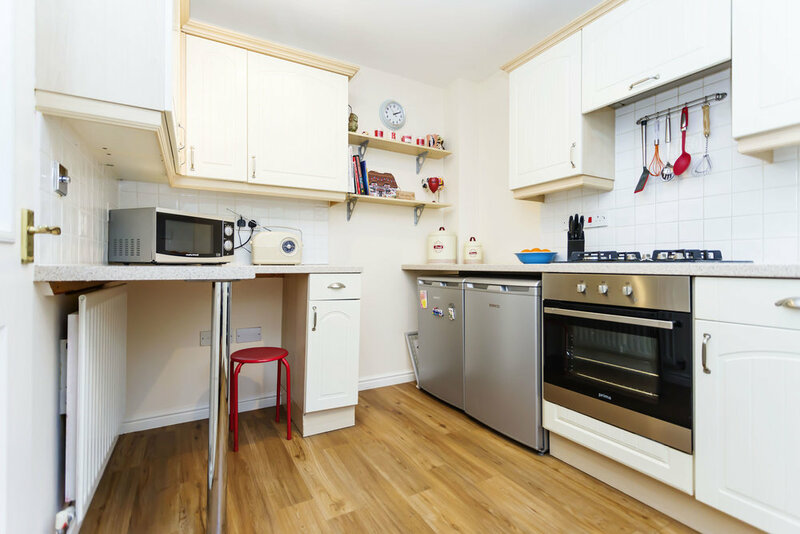 Appliances include built in electric oven and gas hob with extractor over and under counter space for a fridge and freezer. Base and eye-line units give you all the storage space you may need and has the added benefit of fairly new boiler only a couple of years old. There is a large window above the sink giving you front aspect out towards the scenic wooded area. There is a handy downstairs W.C on your left as you come in the front door, as you continue through the hallway to the lounge/diner at the back of the property the immaculate presentation continues in this very generous sized room. There is ample space to create a dining area and still leave plenty of room for the big comfy sofa's, a particularly lovely feature to this room is the fireplace surround and gas fire. The sliding patio door and window both give views out across the rear garden and insure the room is full of light and are ideal in the warmer months to open out to the garden. A nice surprise is the huge storage cupboard that extends back to under the stairs providing lots of storage space. The stairs to the first floor positioned in the hallway take you up to the three bedrooms. 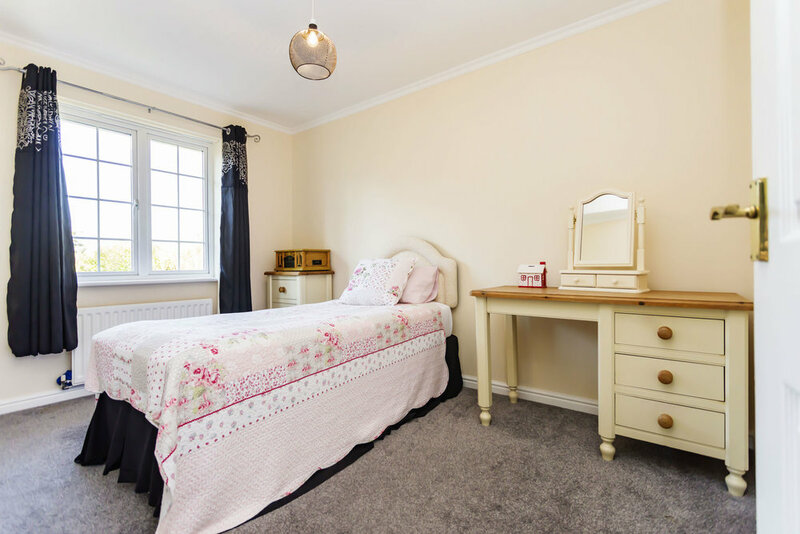 The Master bedroom is at the front of the property and is a generous size with one wall of built in wardrobes and also comes with a shower ensuite, with front aspect it enjoys a view out to the wooded area. Bedrooms 2 is at the rear, again a good size with aspect over the back garden. The smallest of the three is at the top of the stairs and has rear aspect, a good sized single room and all three bedrooms come with a plush deep pile grey carpet. Bedrooms two and three are served by a modern family bathroom, with part tiled walls and tile effect flooring , bath with shower attachment and white gloss finish vanity basin and W.C.
On the landing there is also another large storage cupboard and access to the loft which is partially boarded, fully insulated and has a loft ladder. The property comes with a well designed garden and can be accessed from the side. There is a stone patio in front of the sliding doors on the lounge perfect for alfresco dining, the patio continues along the side to a raised decking area at the rear making a great entertaining space or to enjoy a glass of wine. The garden is finished off with an area laid to lawn in the middle and some bedding borders with well kept shrubs. This is an ideal family home in a great location, in a quiet and peaceful area with the opportunity to just move straight in and add your own personal touches.